WASHINGTON, D.C.–The military medical system is failing to diagnose brain injuries in troops who served in Iraq and Afghanistan, many of whom receive little or no treatment for lingering health problems, an investigation by ProPublica and NPR has found. So-called mild traumatic brain injury has been called one of the wars’ signature wounds. Shock waves from roadside bombs can ripple through soldiers’ brains, causing damage that sometimes leaves no visible scars but may cause lasting mental and physical harm. From the battlefield to the home front, the military’s doctors and screening systems routinely miss brain trauma in soldiers. One of its tests fails to catch as many as 40 percent of concussions, a recent unpublished study concluded. A second exam, on which the Pentagon has spent millions, yields results that top medical officials call about as reliable as a coin flip. Even when military doctors diagnose head injuries, that information often doesn’t make it into soldiers’ permanent medical files. Handheld medical devices designed to transmit data have failed in the austere terrain of the war zones. Paper records from Iraq and Afghanistan have been lost, burned or abandoned in warehouses, officials say, when no one knew where to ship them. But the military continues to overlook similarly wounded soldiers, a reflection of ambivalence about these wounds at the highest levels, our reporting shows. Some senior Army medical officers remain skeptical that mild traumatic brain injuries are responsible for soldiers’ troubles with memory, concentration and mental focus. When Lt. Gen. Eric Schoomaker, the Army’s most senior medical officer, learned that NPR and ProPublica were asking questions about the military’s handling of traumatic brain injuries, he initially instructed local medical commanders not to speak to us. When confronted with the findings later, however, he acknowledged shortcomings in the military’s diagnosing and documenting of head traumas. Soldiers like Michelle Dyarman wonder what’s taking so long. Dyarman, a former major in the Army reserves, was involved in two roadside bomb attacks and a Humvee accident in Iraq in 2005. Today, the former dean’s list student struggles to read a newspaper article. She has pounding headaches. She has trouble remembering the address of the farmhouse where she grew up in the hills of central Pennsylvania. Dyarman’s 67-year-old father, John, looks after her at home, balancing her checkbook, reminding her to turn the oven on before cooking. The joyful, bright child he raised, the first in the family to attend college, is gone, forever gone. Better armor and battlefield medicine mean troops survive explosions that would have killed an earlier generation. 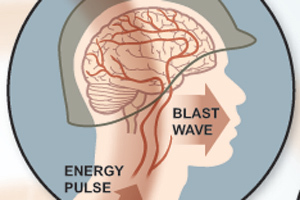 But blast waves from roadside bombs, insurgents’ most common weapon, can still damage the brain. But the most common head injuries in Iraq and Afghanistan are so-called mild traumatic brain injuries. These are harder to detect. Scanning devices available on the battlefield typically don’t show any damage. Recent studies suggest that breakdowns occur at the cellular level, with cell walls deteriorating and impeding normal chemical reactions. The long-term effects of mild traumatic brain injuries can be devastating, belying their name. Soldiers can endure a range of symptoms, from headaches, dizziness and vertigo to problems with memory and reasoning. Soldiers in the field may react more slowly. Once they go home, some commanders who led units across battlefields can no longer drive a car down the street. They can’t understand a paragraph they have just read, or comprehend their children’s homework. Fundamentally, they tell spouses and loved ones, they no longer think straight. Such soldiers are sometimes called “walkie talkies” — unlike comrades with missing limbs or severe head wounds, they can walk and talk. But the cognitive impairments they face can be severe. The military’s handling of traumatic brain injuries has drawn heated criticism before. ABC News reporter Bob Woodruff chronicled the difficulties soldiers faced in getting treatment for head traumas after recovering from one himself, suffered in a 2006 roadside bombing in Iraq. The following year, a Washington Post series about substandard conditions at Walter Reed Army Medical Hospital described the plight of several soldiers with brain injuries. Members of Congress responded by dedicating more than $1.7 billion to research and treatment of traumatic brain injury and post-traumatic stress, a psychological disorder common among soldiers returning from war. They passed a law requiring the military to test soldiers’ cognitive functions before and after deployment so brain injuries wouldn’t go undetected. But leaders’ zeal to improve care quickly encountered a host of obstacles. There was no agreement within the military on how to diagnose concussions, or even a standardized way to code such incidents on soldiers’ medical records. Good intentions banged up against the military’s gung ho culture. To remain with comrades, soldiers often shake off blasts and ignore symptoms. Commanders sometimes ignore them, too, under pressure to keep soldiers in the field. Medics, overwhelmed with treating life-threatening injuries, may lack the time or training to recognize a concussion. Several senior medical officers said soldiers’ paper records were often lost or destroyed, especially early in the wars. Some were archived in storage containers, then abandoned as medical units rotated out of the war zones. Lt. Col. Mike Russell, the Army’s senior neuropsychologist, said fellow medical officers told him stories of burning soldiers’ records rather than leaving them in Iraq where anyone might find them. To improve recordkeeping, medics began using pricey handheld devices to track injuries electronically. But they often broke or were unable to connect with the military’s stateside databases because of a lack of adequate Internet bandwidth, said Nevin, the Army epidemiologist. “These systems simply were not designed for war the way we fight it,” he said. Nevin said that without documentation of wounds, soldiers could have trouble obtaining treatment, even when they report they can’t think, or read, or comprehend instructions normally anymore. Russell said that during a tour of Iraq last year, he examined five soldiers the day after they were injured in a January 2009 rocket attack. The medical staff had noted shrapnel injuries, but Russell said they failed to diagnose the soldiers’ concussions. The symptoms were “classic,” Russell said. The soldiers had “dazed” expressions, and were slow to respond to questions. The military uses an exam called the Automated Neuropsychological Assessment Metrics, or ANAM, to establish a baseline for soldiers’ cognitive abilities. The ANAM is composed of 29 separate tests that measure reaction times and reasoning capabilities. But the military, looking to streamline the process, decided to use only six of those tests. “I wanted to be back with my soldiers,” he said. “I didn’t argue about it.”. Col. Heidi Terrio, who carried out the Fort Carson study, said the military’s screens must be improved. Gen. Peter Chiarelli, the Army’s second in command, acknowledged that the military has not made the progress it promised in diagnosing brain injuries. “I have frustration about where we are on this particular problem,” Chiarelli said. One of Schoomaker’s chief scientific advisors, retired Army psychiatrist Charles Hoge, has been openly critical of those who are predisposed to attribute symptoms like memory loss and concentration problems to mild traumatic brain injury. In 2009, he wrote a opinion piece in the New England Journal of Medicine that said the “illusory demands of mild TBI” might wind up hobbling the military with high costs for unnecessary treatment. Recently, Hoge questioned the importance of even identifying mild traumatic brain injury accurately. “What’s the harm in missing the diagnosis of mTBI?” he wrote to a colleague in an April 2010 e-mail obtained by NPR and ProPublica. He said doctors could treat patients’ symptoms regardless of their underlying cause. Other experts called Hoge’s posture toward mild TBI troubling. To be sure, brain injuries and PTSD sometimes share common symptoms and co-exist in soldiers, brought on by the same terrifying events. But treatments for the conditions differ, they said. A typical PTSD program, for instance, doesn’t provide cognitive rehabilitation therapy or treat balance issues. Sleep medication given to someone with nightmares associated with PTSD might leave a brain-injured patient overly sedated, without having a therapeutic effect. But it wasn’t until she began talking with fellow patients that she heard the term mild traumatic brain injury. As she began to research her symptoms, she asked a neurologist whether the blasts might have damaged her brain. Records show the neurologist dismissed the notion that Dyarman’s “minor head concussions” were the source of her troubles, and said her symptoms were “likely substantially attributable” to PTSD and migraine headaches.